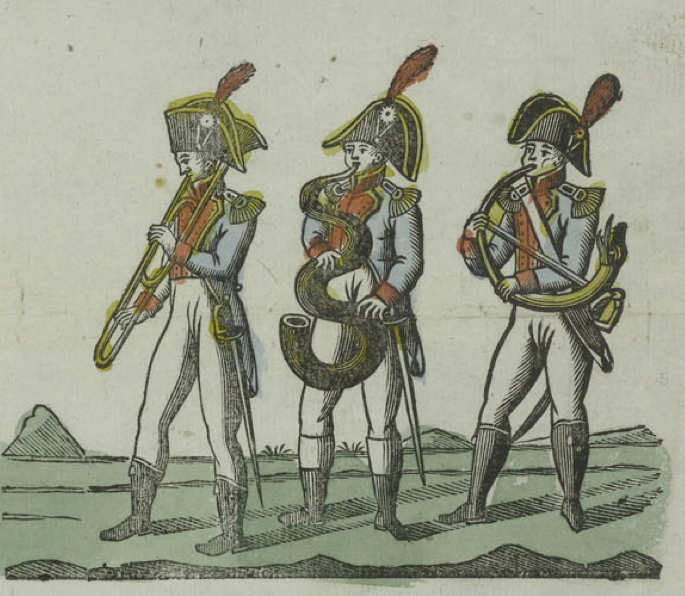 I recently added the below three military trombone images to their respective timelines: 18th century, 19th century (1st half), and 19th century (2nd half). Not only are they all military subjects, but, although they span roughly a century, they also all feature rear-facing trombones (see here for more rear-facing trombones). The other element of interest for a low brass player is the serpents and ophicleides; I will soon be adding the pictures to the post, Serpent & Ophicleide: History and Images. 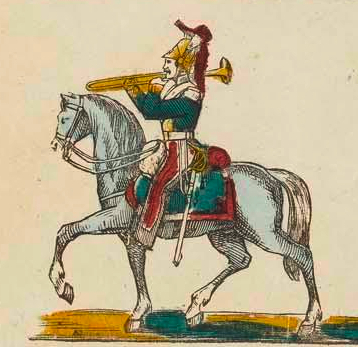 1781-1854—Amsterdam, Netherlands: Military Music, a catchpenny print produced by Erve H. Rijnders, includes a rear-facing trombone (see below detail; public domain) (Catchpenny Prints of the Dutch Royal Library). 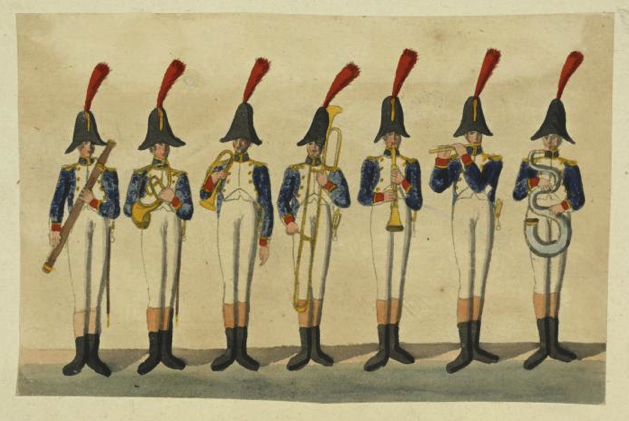 1806—France: An image depicting 7 French military musicians includes a soldier playing a rear-facing trombone (see below image; public domain) (New York Public Library Digital Gallery). 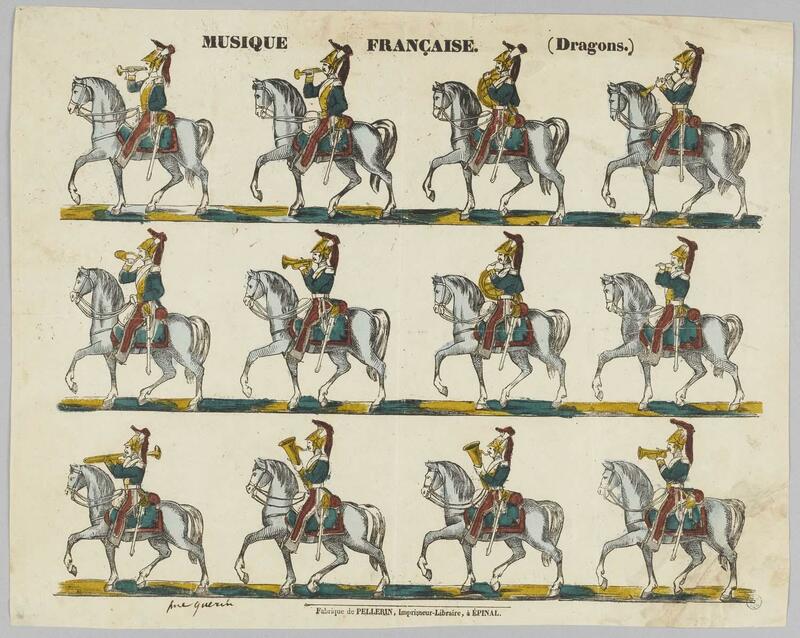 1875-1900—Epinal, France: An image published by Pellerin, entitled French Music (Dragoons), depicts a group of military musicians on horseback, including one playing a rear-facing trombone (see detail and full image below; public domain) (Museum of European and Mediterranean Civilization).